I recently went on another trip to Gloucester. 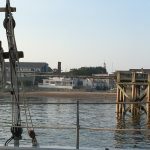 This time, I took a tour of its harbor on the Schooner Ardelle. It is a replica of a 19th century wooden ship that was known as the Pinky Maine. 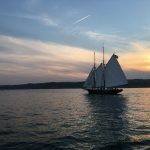 From May to October, it offers sunset sails and music trips, and participated in weekly schooner races and tall ship events. The ship can also be used for weddings, birthdays, and reunions. The tour I went on emphasized the history of the harbor. Gloucester has the oldest seaport in the US (been around since 1632) and it was interesting learning the history behind it. I very much enjoyed the beautiful sunset views of the harbor as well. 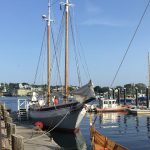 The tour began at Gloucester’s Harbor Loop, where the Schooner Ardelle is docked. Although it is a sail ship, the Schooner Ardelle had a motor, which made it easier to leave the dock. As soon as we were away from the port, we relied on the sails and the wind to navigate through the harbor. Fortunately, we were able to sail near the Eastern Point Lighthouse. The tour happened during a lovely evening as well. The sun was setting with colors of pink and orange and the air was cool and breezy. 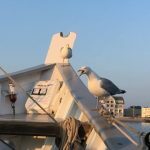 There were other people taking their boats out into the water, and there were plenty of seagulls and black herons flying throughout the port too. One of the other passengers even saw a seal. Two seagulls actually came to the Schooner Ardelle and one of the guides fed them some Cheetos, which was hilarious. I would never have expected seagulls to like Cheetos! During the tour, I learned some fascinating historical facts about Gloucester’s fishing industry. During the 1800s, the city’s fishermen would sail all the way up to Greenland just to catch halibut. I could not imagine making such a journey through the rough Arctic waters to get fish. It is amazing they were able to return to Gloucester because sadly, there have been times when the fishermen did not come back home. Sometimes, the boats would go overboard, therefore drowning them. On a more lighthearted note, one of the guides told us that Duncan Street in downtown Gloucester used to be called ‘Drunken Street’ in the 19th century. Back then, the street was filled with both bars and brothels that were frequented by the fishermen. Nowadays ‘Drunken Street’ has trendy galleries, such as the Cape Ann Museum. It is quite astonishing to know how streets and neighborhoods can transform over time. We also sailed by Fort Point, where Gloucester’s Sicilian/Italian citizens primarily lived for most of the twentieth century. In fact, many of them worked in the city’s fishing industry and lived near the shipyards, which must have been convenient for them. Many years later, a great portion of Fort Point had been redeveloped to build the Beauport Hotel. However, the neighborhood is still used by the city’s Sicilian community, particularly for Saint Peter’s Fiesta’s greasy pole contest. The festival is one of Gloucester’s most beloved events, because it celebrates the city’s Sicilian citizens and fishing industry. We sailed pretty close to the pole and it was funny to see the pole still covered with the oils and fats! Going on the Schooner Ardelle is absolutely a fun activity to do in Gloucester. It was magnificent watching the sun go down over the harbor and I enjoyed learning things about the area that I had not known beforehand. It is something that I would totally do again. I am sure their other tours/events are just as fun. For more information on the Schooner Ardelle, click here.